Have you ever met a person who gets along with everyone? I like to think of hummus as that person; it’s the people-pleaser of dips. Hummus goes great with veggie sticks, on toast, in a sandwich, on crackers, in a wrap, or as I often eat it, dolloped on a baked potato. 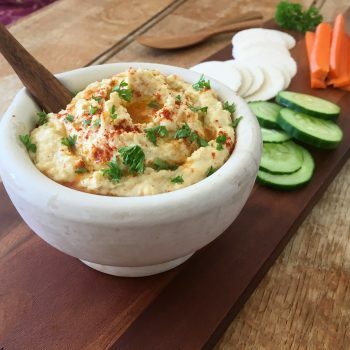 Better yet, with the chickpeas and tahini combined, hummus is a complete protein! Its also rich in fibre, calcium, monounsaturated fats and immune-boosting allicin; a compound found in garlic that helps us fight off coughs and colds. I often take a little box of hummus with me to work, to have with veggie sticks mid-afternoon…provided I’ve managed to keep my co-workers out of it! Its perfect for busy families, as its quick and easy to whip up, requires minimal equipment and keeps for a couple days in the fridge. Hummus can also be frozen, so you can make a big batch and save some for later! Blend garlic in a blender or Thermomix until finely chopped (you may need to stop and scrape down the edges; alternatively, crush the garlic with a garlic press). Add the remaining ingredients and blend till smooth. Taste and adjust accordingly (e.g. if you prefer a thinner consistency, add a little extra olive oil or lemon juice; if you like more sesame flavour, add a little extra tahini). Go wild and smother on everything – toast, crackers, carrot sticks, cucumber slices, baked potatoes, wraps etc.